RUGBY: CHOBHAM have steered themselves away from a relegation dogfight in London One South after beating Maidstone at home 32-18 last Saturday. 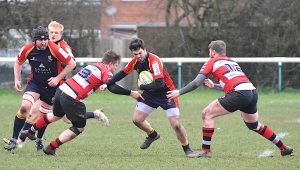 Without a win in their last three outings, Ryan Gregory’s injury-stricken Chobham side knew they had to raise the bar and ensure maximum points to ease their woes. Their Kent visitors arrived at Fowlers Wells having lost 17 of their previous 21 matches this season; conceding 633 points – an average of just over 30 points a game.